But once I hit the streets of Bangkok, I loved trying any Thai food placed in front of me, especially Thai seafood dishes. My love for Thai seafood wasn’t powerful enough to handle any of my pregnancies though. The smell of any fish made me sick, even during our visit to Thailand this last summer! So tragic and sad, I can’t even begin to tell you. But now that I’ve got my appetite back, I’ve been craving Thai fish dishes. 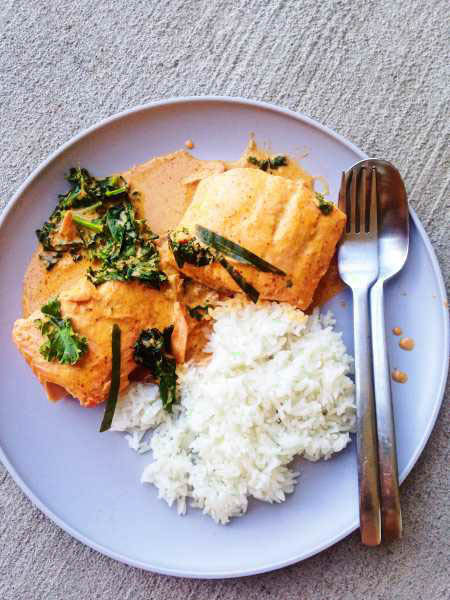 This week I made Thai Salmon Red Curry, which in Thai is, Chu Chee Pla, because of the “chu chee” sound it makes when you fry it. Aren’t Thais are so cute?! It’s one of my Thai Hubby’s favorite dish, and mine too! 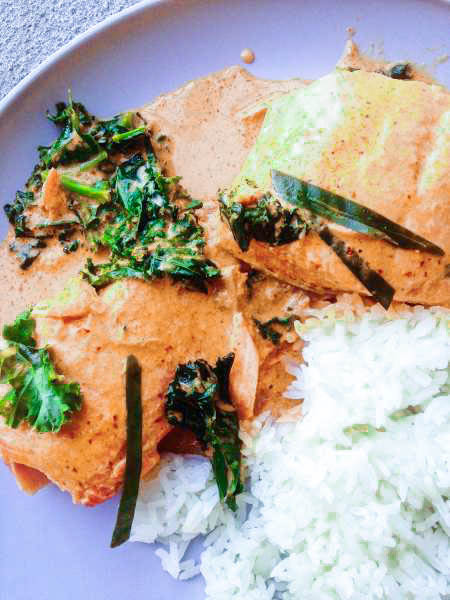 Not only because it’s so full of flavor, but it takes less than 30 minutes from prep to table, and with three sweet kiddos, quick Thai meals make life even sweeter! 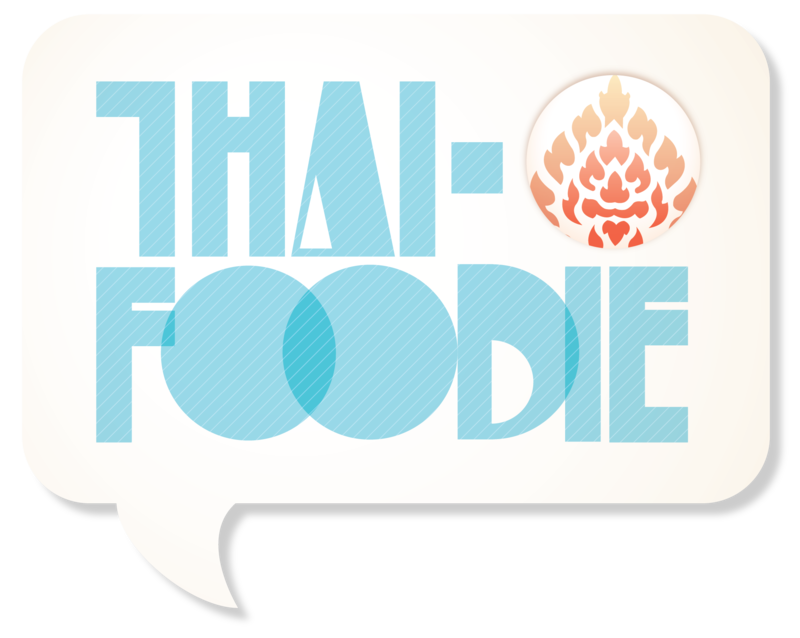 Try it today, and share it on Instagram with us @thaifoodie! I’d love to see your awesome version of it! 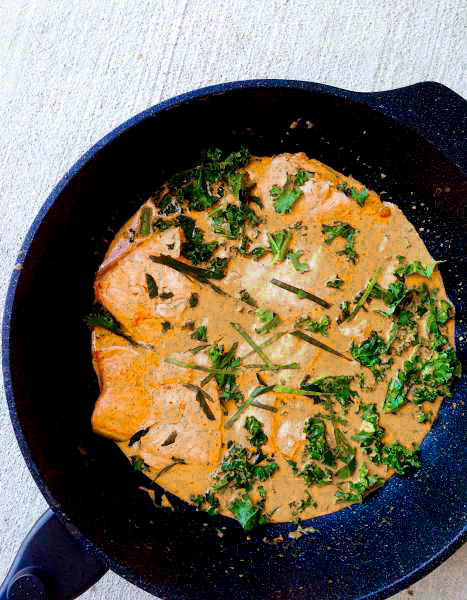 Quick Thai Salmon Red Curry is the perfect weeknight meal since it's full of flavor and takes less than 30 minutes! Can it get more delicious?? 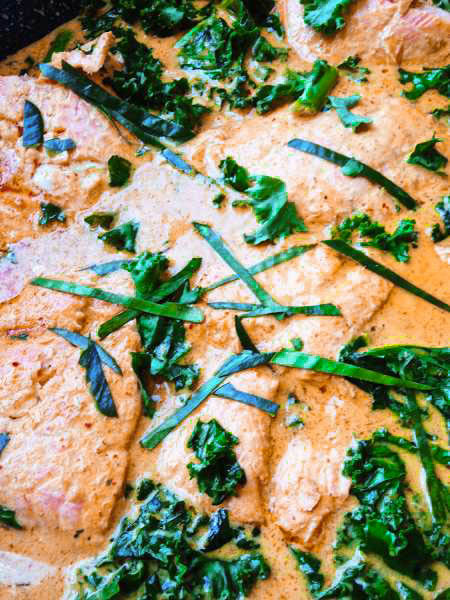 Salmon, kale, Thai red curry paste, and coconut milk! Such a heartwarming treat to get you through your week! SO good! Cook covered for 2-4 minutes, depending on thickness, on medium-low, until it's flaky. You can use other fish if you prefer! Whatever you enjoy most! Don’t forget to pin it on Pinterest to save it for next time!